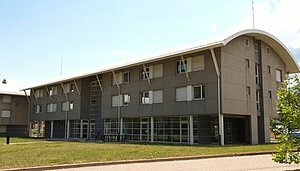 Scientists visiting the ESRF or ILL are usually accommodated conveniently close to the beamlines and reactor, as the site Guest House or "Maison du Chercheur" has 173 rooms available. It offers a number of amenities and services tailored to visitors' needs. Welcome! Outside the reception’s opening hours, you can pick up your room key at the site entrance. During summer and winter shutdowns and when there are no users at the ESRF or the ILL, the Guest House may not be open. All changes are notified in advance to our users. The Guest House comprises three buildings, all of which are conveniently located close to the site entrance. The reception office is in building A.
Continental breakfast is served in building A and other meals in the Restaurant. Also, snacks are available 24 hours a day from a distributor in Building A. Breakfast is also available for those not staying at the Guest House, if this is booked via the reception before midday the previous day. For room reservations and modifications, please do not contact the Guest House directly, as reservations and modifications can only be made through the ESRF or the ILL.
Outside the reception's opening hours, you can pick up your room key at the site entrance. During summer and winter shutdowns and when there are no users at the ESRF or the ILL, the Guest House may be closed. Users are informed in advance of any such changes via Sodexo's news page and other channels.